Brunch with SB means no eggs for her while I stick with brunch classics. This time though at brunch at Montmartre, I decided to join her and “boycott” eggs. 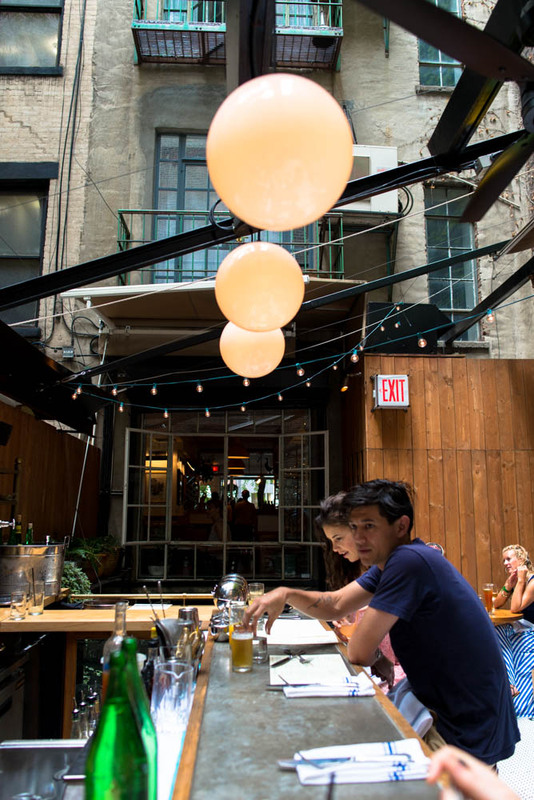 I remember visiting Montmartre when it first opened over 2 years ago, before it had brunch service, before it renovated and opened up a secret back garden, back when Tien Ho was the executive chef. Isn’t it crazy how things have changed so much in such a short amount of time, I thought as we settled into two seats at the bar in the quiet garden. SB decided to be healthy and chose the gorgeous Scottish salmon salad. 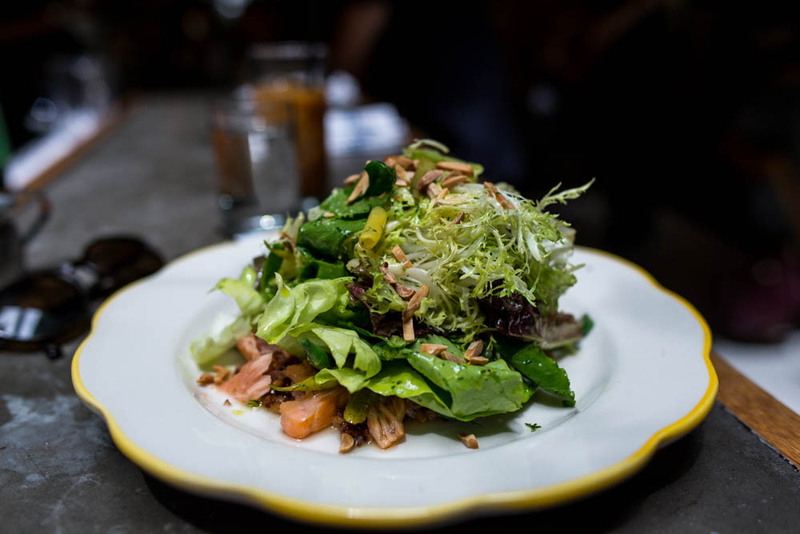 Broken pieces of salmon was intermixed with mesclun, asparagus and almond for crunch. At the bottom of this tall salad was a bed of chewy sweet grains. All dressed up in a light dill dressing, the salad certainly didn’t lack in flavor despite being the healthier option on the menu. As for me, just because I am not eating eggs doesn’t mean I was healthy. Instead, I went all in for the dry aged beef burger with béarnaise cheese and spinach with a side of bacon. 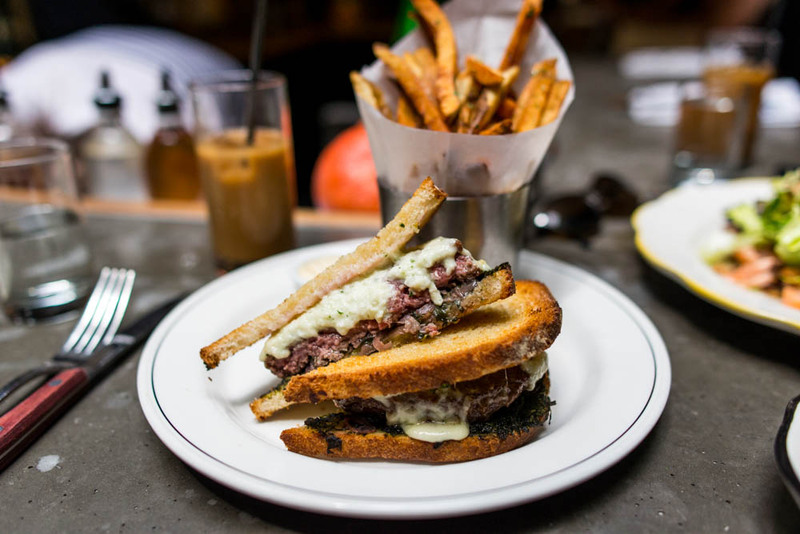 In lieu of a traditional bun, the flavorful juicy patty was served in between two pieces of toasted buttery bread. 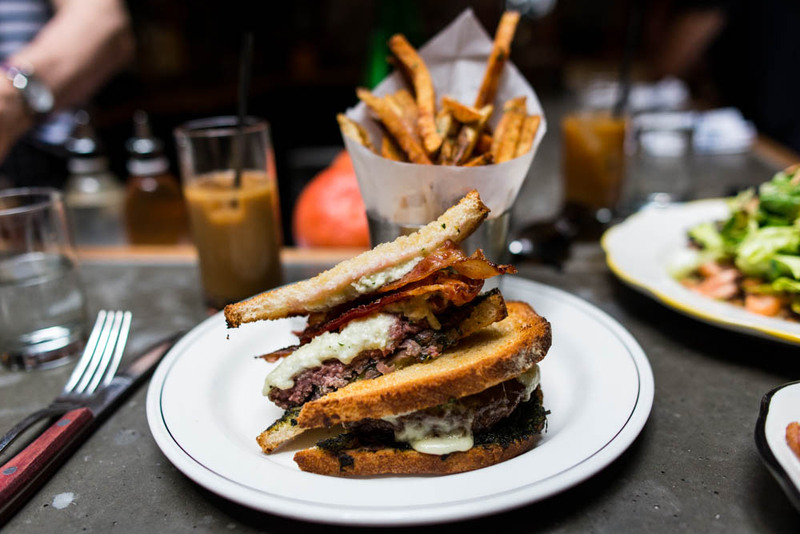 This burger definitely earned its spot on Eater’s best new burger list. When the bacon arrived, the choice was only too obvious. There was no question as to where the bacon will be going. Now if only I had been a little more clever, I would have ordered the burger with a sunny side up egg inside. I am sure it will only be a matter of when, not if, before they start to offer that as a choice for weekend brunchers.